A single mother with 3 boys: 9, 19 and 29 is living together with her little brother; 39. She seeks a shaman that tells her the boys in her family are cursed because of their age, now a huge disaster awaits each of them the following year. Goo Kwang Soo (39, Oh Jung Se) was a successful PD of a music show, when suddenly a scandal occurred and he was demoted to a television show no one watches anyway. The eldest son Kang Jin Goo (29, Kim Young Kwang) is known as a player and is loved by everyone from his work, but who knew he was actually walking around with a huge secret. 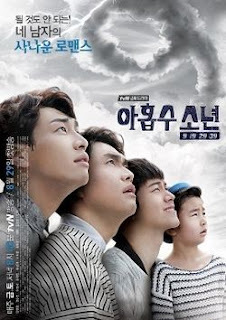 The two youngest boys encounter a lot of problems in love, friends and dreams. How will they tackle the news about new trouble ahead of them? A nice satisfactory drama I must say, the scenario was refreshing from your ordinary romantic comedies around this year, and the actors were very natural, they made it enjoyable to see the story unfold. Plus 9 Boys was supposed to be a 16-episode drama, everything seemed to work fine and with every episode the interest was reaching a new climax, but it was cut down to 14 episodes. To be honest, it felt a bit rushed in the last two episodes and it would have been better if they would stick to the original plan, 16 episodes so as for the drama to flow naturally without a rush and keep the depth of the storyline. Whats up with TvN and cutting their dramas lately… Anyway, I recommend this drama because it is really a sweet romantic comedy.